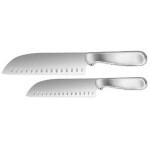 $12.21 For 2-Piece Stainless Steel Ginsu Santoku Knife Set on Amazon.com | A Savings WOW! Right now on Amazon.com, you can get this Ginsu 2-Piece Stainless Steel Santoku Knife Set for only $12.21, plus it’s eligible for FREE Super Saver shipping on orders over $25. These are normally $27 each, so it’s less than 1/2 of the normal cost! These would make a great addition to your own kitchen or a cool gift for someone you know that loves to cook! Remember, as with any Amazon.com deal, you must act fast while it’s still in stock and before the price goes up again (because prices can change at any time on Amazon.com). Find out more information about the Ginsu 2-Piece Stainless Steel Santoku Knife Set for only $12.21!